Quality policy - Borosilicate and quartz glass, mica, sealing, level gauges, armature - Continental Trade. Continental Trade Sp. z o.o. is a supplier of mica and their preparations as well as technical glassware, laboratory equipment, seals and liquid level gauges for large, medium and small businesses. 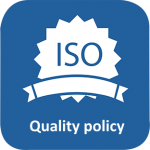 Implement the quality policy in accordance with ISO 9001: 2015 to fill its requirements. The quality system is subject to continuous improvement based on the best practices in the daily functioning of the management Continental Trade Sp. z o.o. Improving the management of Continental Trade Sp. z o.o. in the terms of improving trade and logistics processes, leads to better meet the needs and expectations of our customers and business partners, increase mutual trust and leads to lasting cooperation.